we’re finally here! This is what going down to 4 days a week at my day-job means: I WILL FINALLY POST RECIPES MORE OFTEN, AGAIN! Yeehaw! 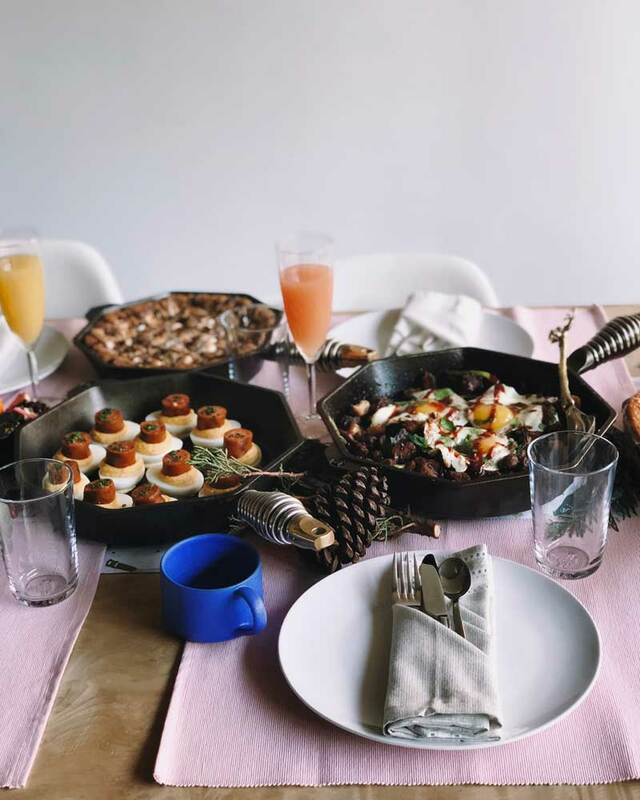 I made this strata in December for a fun brunch I went to with some other lovely Portland bloggers, and Finex. This isn’t sponsored by them, but you guys know how much I use my Finex pan. I love it! It’s gorgeous, and cast iron is just so darn useful. 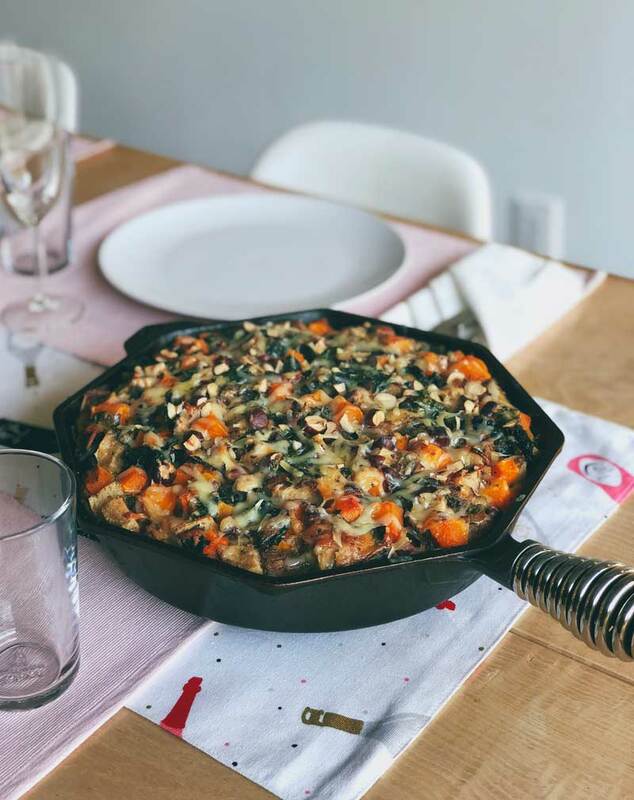 This was my first time making a strata, and it was perfect in this pan! I used some homemade bread (kinda like this, but a 48-hour levain version), veggies we grew in our garden, and tasty tasty gruyere! Other bloggers at brunch were Marlynn (Urban Bliss Life), Holly (The Modern Proper), Amanda (The Happy Little Apron), Lena (Lena’s Kitchen Blog), and some of our other local foodie friends. So much fun!! 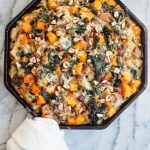 This cheesey strata uses homemade bread, winter vegetables (squash and kale! ), and gruyere for a delicious homemade brunch. Preheat your oven to 425F. Toss the butternut squash with the olive oil and lightly season with salt and pepper. Spread in a single layer on a baking sheet and bake until mostly fork-tender (20 minutes). It’s okay to be slightly under-cooked. While the squash is baking, prepare your other ingredients — cube the bread, shred the cheese, etc. In a heavy 12″ skillet* over medium heat, melt the butter. Add the shallots and cook for 2 minutes, then add the kale. Cook until until wilted, 1-2 minutes. Remove everything from the skillet. In a separate container, whisk together the mustard, thyme, eggs, half-and-half, and 1/2 tsp each salt & pepper. Set aside. Reserve a handful of cheese for the final few minutes of baking — set it aside now! 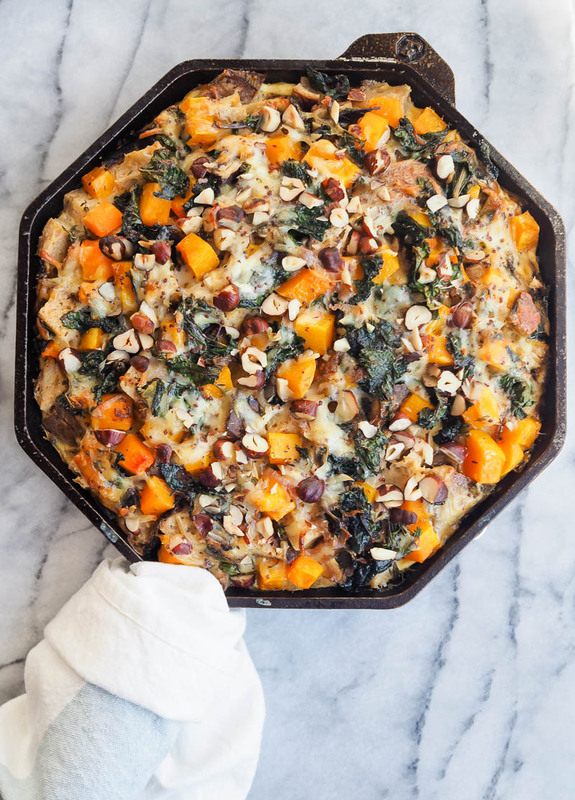 Spread half of the bread in a layer in the pan, then top with a layer of the half of the baked squash, shallots, kale, hazelnuts, and cheese. Repeat with another layer of bread (the remaining bread, assuming it all fits), and the vegetables, hazelnuts, and cheese. Pour the egg mixture over everything in the pan, making sure to saturate all of the bread as you pour. Put everything in the fridge to soak for an hour. (If you can’t, no biggie). Heat (or reduce the heat) the oven to 350F. Cook the strata for 45-55 minutes, then check on it. The center should not be wobbly, and the edges should be browning. This may require baking up to 75 minutes — you don’t want it to be soupy! 5-10 minutes before it’s done, sprinkle on the remaining bit of cheese. Let cool for 5-10 minutes before serving warm. *Make sure your skillet has high walls. If it doesn’t, you can also do this in a casserole dish.